If you live in San Diego and you love wine, undoubtedly you may have heard or know of the San Diego Wine Company. I like to think of their location as somewhat central in San Diego. It's located between the I805 and the I15 on Miramar Road across from what use to be known as "Fighter Town" USA and now is the home of the Miramar Marine Corps Air Station. The SDWC is the home of what I call QPR wines! What is quality price ratio you may ask? It’s simple, it means to me getting the best quality wine for the lowest possible price and most of the time they succeed marvelously in this mantra. However there are a few times I find glitches in the formula, which will ultimately disappoint. Two recent examples of that was my purchase of Port and a Maderia. Both of which meet the low price part of the equation, but failed miserably on the quality portion. In drinking these wines with some friends after dinner, I commented that these wines were more like the "diet" version of your favorite soda. Noting that I did pay a small price for these wines comparatively but this was no solace for the one word review of these two wines, posers! What do I like about SDWC, is that this a no non-sense type of wine store. 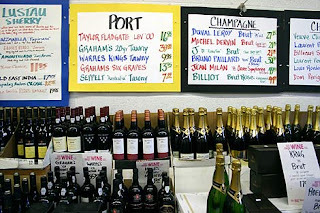 No clever marketing campaign, no slick ads covering the walls, no fancy wine racks, no granite covered anything, just stacks of wine in the case boxes they arrived in with hand written signs and posters proclaiming the screaming deals that await the savvy wine shopper. For Example I purchased the Chateau Soudars Haut Medoc 2005 from SDWC for $19.95 and can be found else where on the web anywhere from $25.00 to 21.00 with shipping, which in my mind $19.95 is a good deal! This wine is definitely a QPR champ, with WS giving this wine a score of 89 points! I believe they still may have some this hanging around which will improve with some bottle aging. Another example, the Sebastiani 2004 Cabernet Sauvignon Alexander Valley I purchased from them a year ago was $23.95 and with a quick check around the web the current price for this wine ranges from $34.99 to the lowest price of $24.95 with shipping not included. This wine exemplifies the SDWC passion for finding wine with high QPR! WS gave this wine a mere 88 points, but if you throw price and availability (which WS does not) into the equation you are easily getting a 92 point wine for about $24.00, that folks is what you call an everyday drinker! A wine to fill up the cellar with for value conscious everyday imbibing and represents many of the screaming deals they have waiting for you at the SDWC. 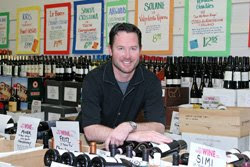 Other great benefits of the SDWC, is that the owner Matt Francke who labored for seven years as the Assistant Manager before seizing his opportunity to purchase the store from the previous owner is that you will never meet a nicer guy in the wine biz, personable and knowledgeable about all things vino. Hit him up for a recommendation and he will probably have 4 or 5. They also have great flyer or newsletter they send out each month and if you're green conscious, so are they and recommend having the flyer sent to your email inbox, where the newest deals come packed in a neat PDF file.They also keep their store air conditioned, even during the peak days of heat here San Diego protecting the precious cargo inside. One of the better benefits is that SDWC also has tastings every Saturday so you will have an opportunity to "try before you buy" for a very modest fee, (normally around $10.00) considering how many wines you are able to taste in a single tasting. Last but not least, ladies if you struggle to muscle out a couple cases of wine to your waiting vehicle the gentlemen there will be glad to assist you with a carry out service. Some of what you could call the downside is that SDWC does not take the AX card, while it helps keep costs low; some customers wanting to pay with this method are disenchanted by this fact. The tasting room experience is nowhere to be found, you really are on a self guided discovery, for which the uninitiated may seem somewhat daunting for discovery. While the SDWC, proclaims they taste through every wine before it gets in the back door and onto the floor I believe as I mentioned earlier a few slip into the inventory that in my opinion don't deserve floor space. It's is possible that in order to buy some desirous lots of wine from a distributor at a certain price point they may be coerced into accepting wine that does not meet the perquisite criteria stated above. Over all my recommendation the SDWC is a great place to purchase wine. A shop which I frequent as often as I can afford, as it's difficult to get out of the store without a case purchase or two. I highly recommend it to all my friends and acquaintances, from who I only hear good things about their individual experiences. Many folks who are just starting out in getting to know wine, who tend toward the sweeter varietals will like the many options to choose from and the great price points. Until next time (and to borrow a phrase) stay thirsty my friends, cheers! I'm not familiar with this store? I venture down to San Diego often, but I tend to stick to the North end of the area rather than downtown. I love the white boards and no-nonsense approach. Very cool. You should stop by and see them on your next trip to San Diego. Tell them the Cuvee Corner Wine Blog sent you, I would love to hear about your experience. Cheers!